The world we live in! : WHEN WE WERE SMALL WE WERE CERTAINLY NOT LIKE THIS. WHEN WE WERE SMALL WE WERE CERTAINLY NOT LIKE THIS. Cute baby photos are what i scan a lot these days, and i save some of them too. So if somebody is seeing my lap top for instance will know immedietely that here is someone either expecting or expecting to be an expecting mom.. uff.. so much for the speculation, and so much for the jumbling of words and the mind. Switch on the TV and you ll find them selling you every damn thing, from a toothpaste to soap, from a basmathi rice to noodles, from technology to life insurance policies, my God, they are everywhere, they are the best sales people according to me and a lot of advertising gurus and the numbers are telling it. A shoo cute little kid says something awfully cute, and look what you are doing the next day in your super market. Yes, you are actually buying that toothpaste that dream kid vouched for, or you are thinking of replacing that or scooter for a new one just because the kid thinks its cool. Think about it, how many times have you done it! Hmm.. i can say i have fallen for that innocent smile and cute lines quite many times. And God save parents who have the same age children as those kid models, they really have a tough time convincing their kids against something unneccessary. Now have you noticed that when you think of kids its always one of these cute little blond babies that come to your mind, like the cerelac ones or the johnson and johnson ones.. we all want the cute ones.. we adore them, they are shoooo cute and so on goes the adulation. Yes i know now lot of you wont agree with me on the face but , just lets give it a thought and tell yourselves the truth, we all think cute. we all think fair, cute, chubby blond babies who grow up into cuter children. 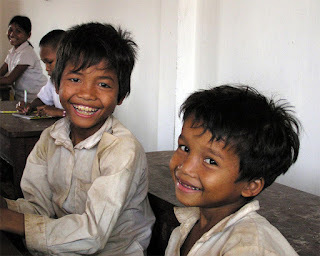 I was shocked when i asked my maids cute little smiling child, what all does he study in school. The boy who claims to be in 6th, (looks like a 1 st standard child) said, emmm,, nothing much.. ganitha- i asked- okhay- what else- he was like, kannada- great, what else- emm, nothing much, ganitha only.. he said they come to teach only ganitha which is math.. I asked what about English, what about the others. He said, our English teacher doesnt come to school. COme againe.. i have read about this in papers, but i assumed that, ok, i am an aware elite class person, i know i have read about these things that teachers dont attend their classes in Government schools, but this is REALL?? and this happens inspite of the "enlightening ARTICLES" appearing in the newspapers?? really?? teachers dont come to school, so they actually bunk classes. shouldnt such teachers be fined.. shouldnt such irresponsibilty be accounted for, just because its a government school and the cute, elite, priveledged kid doesnt go there, shud it be run so badly. Shivappa, sorry not the poster boy kid of our dreams, attends school from 8 am to 3 pm, and what does he learn, how many classes does he have in a day, does he have a time table, does he have a lunch break, does he have tests, does he actually study for them, do he and his friends actually have a PT class? or are they just left out like cattle into the playground at that time. I really want to know. Dont Shivappa and his likes deserve a decent education if at all. But as i say this another thought occured to my mind that is atleast they are not uneducated, maybe someday Shivappa will realise his true potential and will study hard and ask for his classes his right that a teacher assigned to his class actually comes and teaches the lessons he is meant to be learning. Do these kids also cry for that new choclate they saw in an ad in a cute baby's hand? Do likes of SHivappa, make a hue and cry about not having the latest X box? Do they cry about not able to win the tennis match because of not having the latest Nike shoes? Do they fuss about loosing a reality show? I dont know, i really dont, but i want to know. I want to know what these real life poster kids, do to fit in, or not fit in. It aches, we talk about the beggars on the street, make movies on them, give them stardom, but do we really care. Lets try, to make every kid we know the poster boy we dreamt of, it is his/her right. Because every child deseves the best. Because in his own right he is already the best. This is so well written about the ground realities. Wish everyone would take some time off their busy day to understand such facts. I have been thinking lately why all this lifestyle tantrums from the grownups. Why we are ready to shell out 20K a month for a high end car but not shell out Rs.200 to educate a poor student? Why cant we set aside say just 2% of our earnings for the society to uplift the downtrodden? Though, lot many are doing their best for the society but still there are lot many unaware of the ground realities and eagerness to help. yeah chethu, Thats true.. lifestyle tantrums, i like the word. what else do you think we could really do to contribute? Where else can we contribute? A lot can be acheived if only we have the time and attitude towards it. Individually we cannot do much but there are many many organisations striving for a better society, if we can be part of them and infuse them with new ideas, we can contribute a lot.